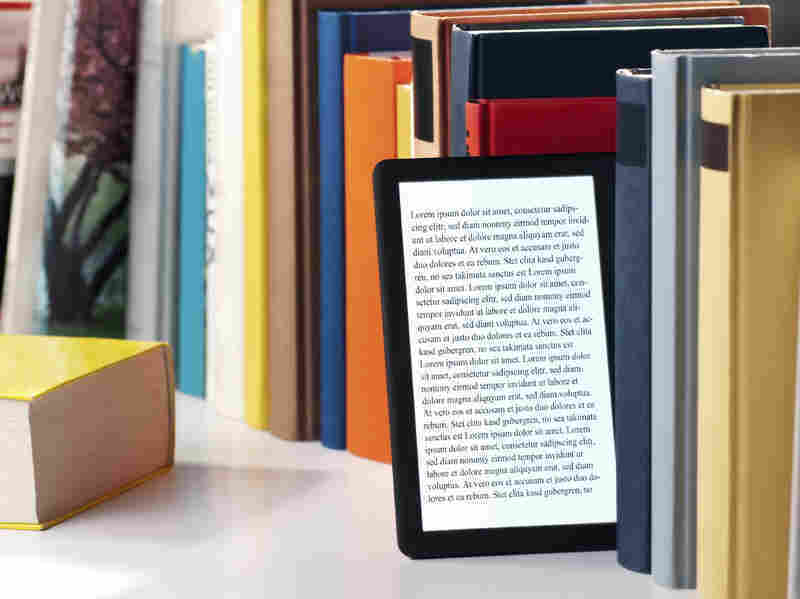 New E-Book Lending Service Aims To Be Netflix For Books : All Tech Considered The website Scribd, online for several years now as a document storehouse, is beginning an e-book subscription service that will offer unlimited e-books for a flat monthly fee. Lynn Neary reports that Scribd is working with HarperCollins, which is the first major American publisher to take part in this kind of subscription service. Movie lovers have Netflix, music lovers have Spotify — and book lovers (whether they read literary fiction or best-selling potboilers) now have Scribd. The document sharing website has been around since 2007, but this week it launched a subscription service for e-book lending. Though Scribd now has the backing of Big Five publisher HarperCollins, it began as a self-publishing site. CEO and co-founder Trip Adler says his father, a doctor, wanted to publish a medical paper. "We wanted build a site that would let him more easily just get his paper up there on the Web and distribute it, and we quickly expanded that to other kinds of content like books, school papers, essays, creative writing." Scribd now has 80 million monthly users, and the new subscription service will allow them access to unlimited e-books on any digital device for a fee of $8.99 a month. That will include most of the books on the HarperCollins backlist. "We thought this through on both the reader side and on the publisher's side," Adler says. "So on the readers' side we want a simple value proposition where they pay a flat monthly fee and they can read whatever they want. On the publisher's side ... we made it fit their traditional models where they get paid every single time someone reads a book, so it's almost as if they're selling books through this service." Scribd is buying the books, not the reader — who will not even notice that the transaction is taking place. "The moment the consumer reaches a certain percentage of read it triggers the sale," says Chantal Restivo-Alessi, chief digital officer for HarperCollins. Her company is the first major publishing house to take part in this kind of subscription service. Restivo-Alessi learned from her experience in the music industry that you have to get in early on new digital business models. "If you don't participate, it's very hard to influence. If you want to influence and impact the models, you have to be part of forming those models," she says. "You can't sit on the sidelines." And, she adds, it's impossible to predict what will succeed in the digital marketplace. "We don't know whether this is going to be working, not working; we don't know whether there are differences by consumer type, by genre; and part of us participating is really having the ability to obtain information from our partners and learn what works and what doesn't in partnership with them." Scribd CEO Adler expects a lot more subscription services like this will be springing up soon — and they'll all be in competition with Amazon, Apple and Google, but that's not all. "What we're competing with the most is other forms of media. These people are spending a lot more time watching videos, listening to music, playing games on social media, and what we're really doing is we're sticking up for books."